Its time for a little DIY project. Actually, I spent the majority of the week doing several projects I have been wanting to do. The kegerator's interior needed some attention. 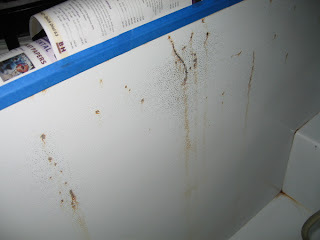 Since the temperatures are above freezing, water condensation eventually breaks through the laminate and starts eating away at the sheet metal. Once oxidation takes over, the process accelerates. After allowing the kegerator to warm, I thoroughly cleaned all of the interior surfaces. I then sanded all rusted surfaces and taped off the edges. 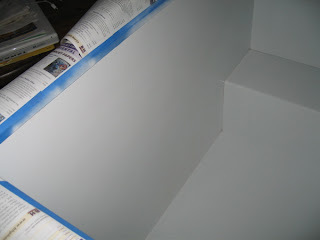 Image below shows sanding about 1/2 way completed. 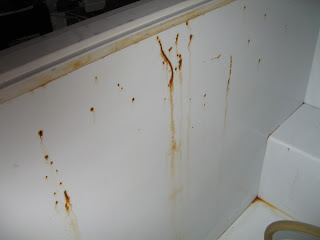 There's no need to sand off the paint completely but you want to sand away as much of the rust as possible. 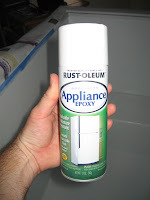 At most hardware stores, in the spray paint isle, you'll find Rust-Oleum Appliance Epoxy. I picked this up at Home Depot for $3.99. 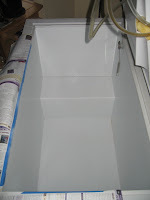 Its moisture resistant and dries to the refrigerator-like glossy finish. Spraying this stuff in the chest freezer created a think paint fog inside. I was only able to spray for about 10 seconds at a time before being overwhelmed by the fog. I would suggest wearing a long sleeve shirt and a rubber glove for your spraying hand. Also, wearing a face mask would have been helpful. Dipping my arm in the paint fog left my arm hairs white (washed up with soap and warm water). Even with weather warm and dry, the paint took about 4-5 hours to be dry to the touch. I waited until the next day to fill it back with kegs, secondary fermentation tanks, and the CO2 system. For about $4, the interior of the chest freezer kegerator is now looking sharp and clean. While painting, I also recharged the desiccators so the interior should remain dry at least until the end of the summer. I still want to install a single manifold gas system and send the CO2 tank to the outside. Since we are moving in the fall, I'll wait on this project.